Stoughton, 59 @ Canton, 52 – Final – Sophomore Cam Andrews scored 15 of his game-high 23 points in the second half to lead the Black Knights. Junior Cam Gomes added 12 points and seven rebounds, junior Matt Valle had 10 points and senior Brandon Teixeira had 12 rebounds and seven assists. Sophomore Tony Harris led Canton with 22 points and seven rebounds, freshman Devin Foster had 11 points and nine rebounds and Michael Harris chipped in with seven points and eight rebounds. Milford, 76 vs. Tantasqua, 62 – Final – Facing a three point deficit at halftime, Milford poured in 52 points in the second half to hand Tantasqua just its second loss this season. Dimitry Torres led the Scarlet Hawks with 23 points while senior Dwight Anderson notched his second straight double-double with 20 points and 10 rebounds. Zack Tamagni added 14 points, Anthony Arcudi chipped in with 10 points and sophomore Kayden Kelley had 15 rebounds to go along with seven points. Stoughton, 36 @ Canton, 57 – Final – Hannah Jerrier was the top scorer for Canton with 19 points and Shannon Foley chipped in with 12 points on four three-pointers. Foxboro, 45 vs. Hanover, 52 – Final – Ashley Sampson led the way for Foxboro with 20 points and 11 rebounds, including 13 points in the second half as the Warriors battled back from as many as 18 down to cut the lead to seven in the fourth quarter. Grace Tamulionis and Cassidy Harrison each added nine points for Foxboro. Oliver Ames, 57 @ Norwell, 39 – Final – OA rallied from a first quarter deficit to take a two point lead at halftime. The Tigers then dominated the second half, including an 18-4 third quarter. Francesca Calabraro led the Tigers with 22 points and six steals while Kayla Raymond added 10 points. Oliver Ames will play Brockton in the tournament finals on Thursday. Oliver Ames, 4 vs. Sandwich, 1 – Final – Four different players found the back of the net. Matt Mancini (assisted by Brett Williams and Eric LeBlanc), Cullen Gallagher (from Max Ward and Owen Gallagher), Eric LeBlanc (from Owen Gallagher and Matt Mancini) and Ben Litwack (unassisted) scored for OA. Owen Gallagher was named to the Jeff Hayes tournament team. 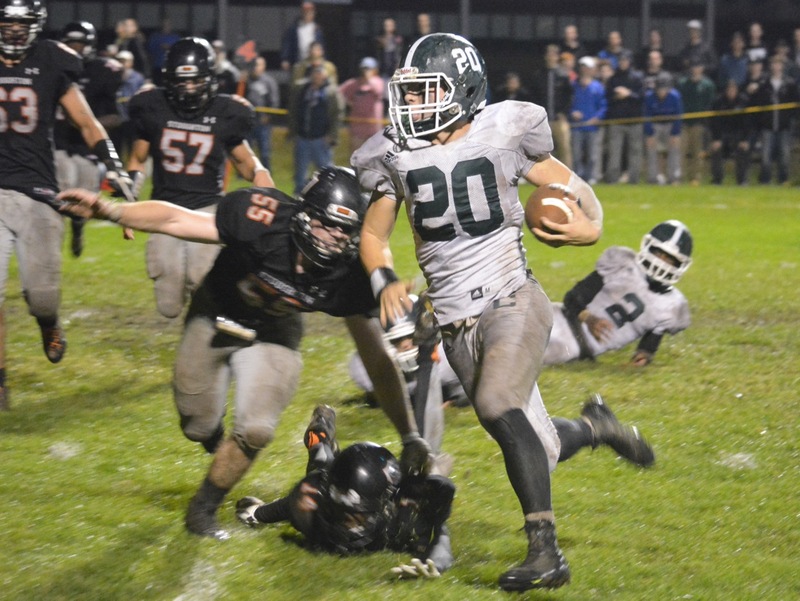 PROVIDENCE, R.I. – For three quarters, the Canton Bulldogs gave Norwood all they could handle. The game was knotted 31-31 through 24 minutes but over the course of the final moments of the third quarter and the first couple of minutes in the final quarter, the Mustangs rattled off a 12-0 and that was all the separation they needed to pick up a 52-42 win over the Bulldogs. Sophomore Tony Harris drained a corner three with 3:52 left in the third quarter to put Canton ahead 31-28 but the Bulldogs were unable to register any points for the rest of the quarter and for the first 2:48 of the fourth quarter — totaling a 6:40 scoreless stretch. In that time, Norwood tied the game by the conclusion of the third and the continued their run to go up 40-31. “We’ve had some scoring droughts throughout the course of the season and we’re trying to overcome that,” Canton head coach Ryan Gordy said. “That’s been the difference in a lot of games for us. That one run that teams have gone on, late in the third or early in the fourth. History repeated itself in this game. All in all, I’m happy with the effort. I thought we battled and clawed a bit. Harris hit another three with 5:12 to go in the fourth to snap the cold streak and the run and Canton continued to crawl back into the game. Harris drove to the basket for another bucket to get the Bulldogs within four. Norwood stretched it back to seven but again Harris drained a three to get within four with two minutes to play. That would be as close as the Bulldogs would get. With gambles for steals and fouling, Norwood would be able to keep its six or seven point lead for the remainder of the game. It was a slow start for both teams, who combined for nine turnovers in the first eight minutes. Tony Harris, Michael Harris and freshman Devin Foster each scored a field goal to help Canton stay even (6-6) after one. The Bulldogs created slight separation going into the halftime break, using their best offensive quarter (14 points) to get a one point lead (20-19) into the locker rooms. A traditional three point play from Griffin Jerrier gave Canton a four point cushion just over midway through the second and Harris closed with a pair of threes put to the Bulldogs up. Canton twice had five point leads to open the third quarter, a drive by Tony Harris and a bucket from Michael Harris made is 26-21. With the game tied at 28-28, that’s when Tony Harris would hit Canton’s last field goal before the cold stretch. For Canton, Tony Harris had a career-high 22 points and five rebounds, Michael Harris had 10 points and five rebounds, Foster had six points and three assists and Jerrier finished with four points and five rebounds. Canton (2-12, 0-11) will be back in league play on Monday night when they host Taunton at 6:30. Canton, 42 vs. Norwood 52 – Final – Tony Harris scored a career-high 22 points and hauled in five rebounds but the Bulldogs couldn’t recover from a 12-0 run for Norwood in the second half. Michael Harris added 10 points and five rebounds. Foxboro, 65 vs. Bridgewater-Raynham, 53 – Final – Jason Procaccini led the Warriors with 21 points and seven rebounds. Alex DuBrow finished with 15 points, five rebounds, and six boards and Rob Lowey had a double-double of 12 points and 12 boards. Foxboro clinched the win with a 22-6 fourth quarter. Milford, 75 vs. North Attleboro, 63 – Final – Milford connected on 12 three pointers for the second straight game. Sophomore Kayden Kelley had a career-high 16 points and added eight rebounds. Dimitry Torres also scored 16 points for the Scarlet Hawks. North Attleboro’s Brent Doherty had a game-high 21 points and sophomore Mario Bresko added 17 points. Mansfield, 66 @ Brockton, 68 – Final (OT) – Brockton rallied from a 10 point deficit at the end of the third quarter and then stole the ball on Mansfield’s final effort in overtime. Matt Ehrlich had a team-high 20 points and five rebounds, Max Boen had 14 points and three assists and Sam Golberg had nine points to go along with 13 rebounds. North Attleboro, 63 @ Durfee, 45 Final – Ashley Ahern was the top scorer for the Rocketeers with 16 points. Caroline Collard added 12 points and Emily Peters had 10. CANTON, Mass. – After surrendering a touchdown on Canton’s opening possession, Foxboro’s defense didn’t break again. The Warriors’ offense scored 10 unanswered points in the second half and the defense tossed a shutout in the second frame as Foxboro beat Canton, 10-7, in the HockomockSports.com Game of the Week. The Bulldogs took the opening drive of the game 77 yards on 14 plays, running the ball every single down to take over eight minutes off the clock. A four yard toss to the right to Woanyen Mahn with 2:48 left in the first quarter put Canton ahead 7-0. Foxboro’s defense bent a little on a handful of Canton drives throughout the rest of the game, but never broke. The Warriors nearly responded right away, getting to 2nd and goal from the Canton two yard line but a rush for a two yard loss, a sack from Canton’s Brian Smith and a pass breakup in the end zone from Mahn forced a turnover on downs. Canton went back to work on the ground, this time running 18 plays and getting all the way to the Foxboro 23 yard line. Facing 3rd and 7, Foxboro’s Allston George got into the backfield for a sack to force Canton into a 46 yard field goal that just fell short. At the half, Canton was up 7-0 and had had run over triple the plays (32 to 9) that Foxboro’s offense had. Foxboro started the second half with bang, as junior Mark Clagg connected with Connor McNamara over the middle and McNamara turned it into a 29 yard gain. A defensive penalty moved the ball up five more yards and then Foxboro was able to find the end zone. Clagg took the snap and was able to dance his way around two would-be tackles in the backfield and eventually dumped the pass off to running back Ronnie Martin. Martin took the pass, broke through a tackle and raced his way in for a 43 yard touchdown along the right side. 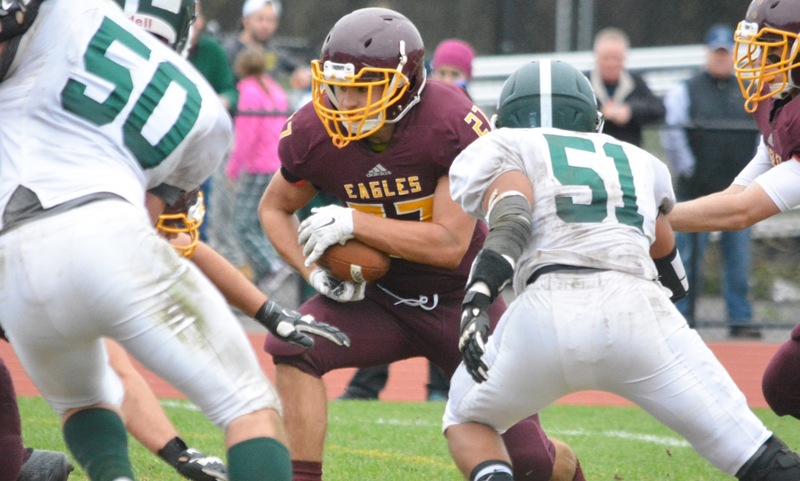 Canton’s offense started to move the ball yet again on the ground behind the combination of Jake Ragusa (21 carries, 125 yards), Mahn (nine carries, 40 yards) and Joe Bires (25 yards), moving into Foxboro territory. But a five yard penalty, a four yard loss and then a sack pushed Canton into 3rd and 23. Quarterback Dennis Ross nearly completed a long pass to Michael Harris for the first down but the ball just slipped through Harris’ one hand attempt. The punt was nearly a disaster but Thomas Monagle was able to track down the high snap and still get a punt away. Clagg then took a QB option for 39 yards to the Canton 15 yard line but the Bulldogs defense would stand tall. A three yard rush from Austin Ryan (81 all purpose yards) was followed by an incompletion and then a rush for no yards. Foxboro junior John Cronin then drilled a 29 yard field goal, his league leading fifth of the season, with 1:16 left in the third quarter. Canton was forced to punt again (and another great play by Monagle to snag a high snap) but the Bulldogs defense forced Foxboro to do the same. This time it was a high snap from Foxboro that went over Clagg’s head. Canton’s Dijmon Harding was able to get to Clagg before he could get anything off and forced a 21 yard loss and a turnover on downs. Canton took control in the Foxboro red zone at the Warriors’ 18 yard line with 7:10 left. That’s when Foxboro’s defense had it’s best stand of the game. On first down, Foxboro’s front four got a great push and caused a loss of six yards on a rush. An incomplete pass over the middle was followed by a 10 yard run from Ragusa. Canton’s field goal attempt from 31 yards just sailed wide and Foxboro kept its lead with 5:34 to play. 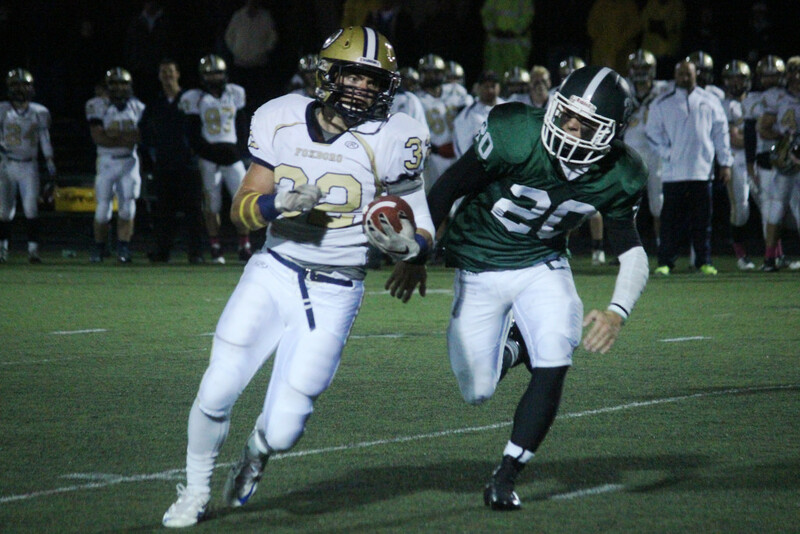 From there, it was heavy dose of Ronnie Martin (13 carries, 46 yards). Martin took the first two hand offs for a total of four yards before Clagg connected with McNamara for nine yards and first down. Another carry from Martin was followed by a QB option run by Darren Kelly that went for 21 yards and a first down. Four straight carries from Martin set Foxboro up for 3rd and 7 and that’s when Ryan took a sweep up the left side for eight yards and a first to ice the game. “The two quarterback [Clagg and Kelly] situation, I have to give me coaches Mike Bordieri and AJ Dooley a lot of credit for working their magic with that,” Martinelli said. “They both understand their role and root for one another and today’s day and age, that’s hard to do. Canton finished with an advantage in first downs, time of possession and rushing yards but Foxboro came away with the win to move to 4-0 overall. 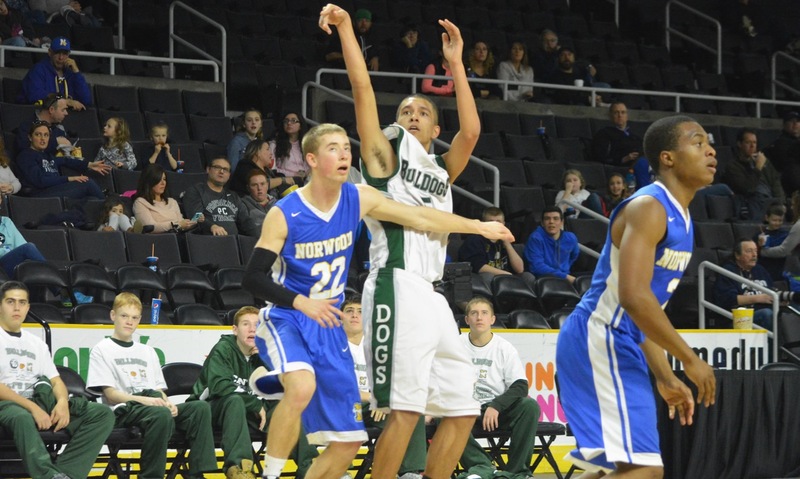 The Bulldogs suffered their first setback of the season but were able to push the Warriors, who are just one of two remaining undefeated teams in the Hockomock and just one of three in D4 South, to the limit. “I feel like it was a tale of two teams,” Canton head coach Dave Bohane said. “They’re kind of a finesse team and can throw the ball very well with two good quarterbacks and good receivers and we’re more, come at you on the ground team. I thought both teams did exactly that. But Martin is a good runner and I have a lot of respect for him and I knew he would play a factor at some point. They are good but I thought our kids played very well, I think we limited their plays as much as we could. I think we did what we set out to do but we came up short. Foxboro (4-0, 2-0 in the Davenport) will look to continue its perfect start when they host Milford (2-2, 1-1), which is fresh off a 42-8 win over Oliver Ames. 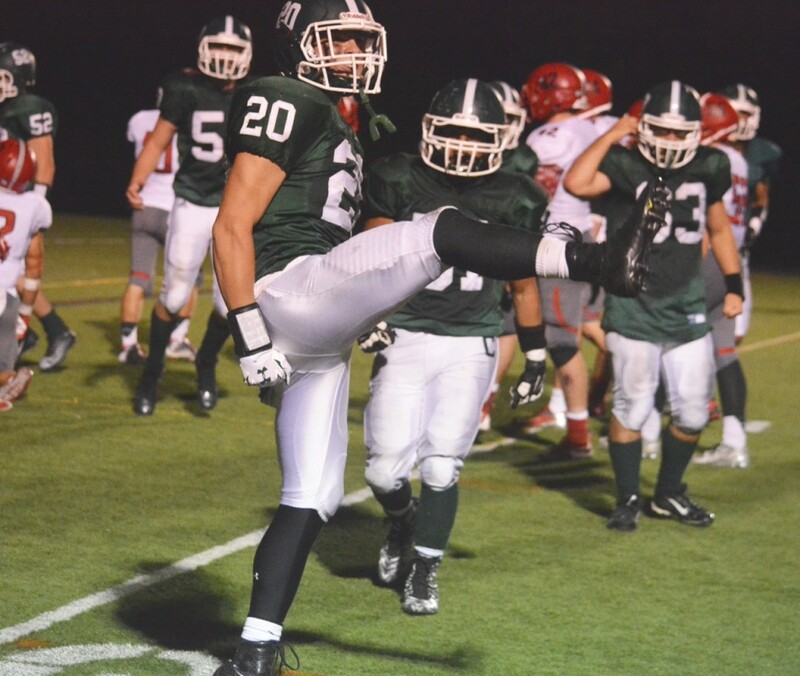 Canton (3-1, 1-1) will look to bounce back when they travel to neighboring Stoughton (2-2, 2-0) on Friday night. CANTON, Mass. – The official walked over to the sidelines with 45 seconds remaining on the clock and commented on how great the game was and that he was impressed that Canton was going to be 3-0. He laughed when it was suggested that maybe he was speaking too soon. He joked, if Milford came back that he would take the blame from the Canton coaches. Forty-five seconds later, the game was heading to overtime and the official could only shake his head about his earlier statement. Canton recovered and pulled out the win, despite giving up a touchdown with just eight seconds left in regulation. The Bulldogs defense held Milford to just one yard gained on three plays in overtime (in which each drive starts at the 10 yard line). After Hawks kicker Sean Lehane sent his 25-yard field goal narrowly wide of the right upright, Canton had the chance to end the game. Jake Ragusa went five yards on a toss sweep and then, on second and goal, fellow captain Joe Bires took the handoff up the middle and into the end zone to send the sidelines charging onto the field for a raucous celebration. The 27-21 victory was the second straight overtime win for the Bulldogs and, remarkably, six points is the largest margin of victory in any of their three games thus far. Milford (1-2) was on the verge of putting the game away in the first half. Blake Hill (119 yards of offense) had scored on a four-yard run in the first quarter to give the Hawks the lead and he pulled in a 28-yard strike from Zach Lanzetta (10-23, 208 yards) with 1:02 left in the half to make it 14-0. The crowd was quiet, the bench was down, and Canton was in desperate need of life. Ragusa provided it on the ensuing kick-off. He took the kick to the left and raced 70 yards before being dragged down at the Milford 15. Three plays later, Dennis Ross hooked up with Michael Harris in the back of the end zone to cut the lead in half. Canton punted on its first possession of the third, but Hill fumbled on the first play of Milford’s drive, as he was fighting for extra yards, and it was recovered by Woanyen Mahn at the Hawks 20. Ragusa (20 carries, 120 yards) went 13 on first down and then got seven yards, and six points, on the next play to tie the game at 14-14. The score stayed the same until late in the fourth quarter when Canton got the ball back at its own 10. Bohane could be heard telling his assistants that he did not want to take a shot and risk a turnover, so the Bulldogs stayed on the ground. Ragusa and Bires got a first down, then it was Mahn with a 17-yard sweep. After taking a shot downfield, Ragusa again went for 12. Mahn followed it up with 11 back to the near sideline. On the 10th play, Mahn again got the call and took it 16 yards to the Milford 15 forcing the Hawks into a timeout with 1:51 remaining in the game. On third and three from the eight, Ragusa went around the left side and carried the pile across the goal line for the go ahead score. The drive lasted 13 plays and covered 90 yards and put the Bulldogs up 21-14 with just 45 seconds left on the clock. Milford got the ball back at its own 37. Lanzetta, who was under pressure from Djimon Harding and Kymauny Roland most of the game, threw three straight incomplete passes. But on the third, a flag was thrown for defensive holding to give the Hawks another first down. After an eight yard completion to Jack DeSantis got the ball in Canton territory with 18 seconds left, Lanzetta found Leonardo Moronta on a deep crossing route and one broken tackle on the far side later he found paydirt on a 45-yard touchdown that stunned the crowd and the Canton sideline. Rather than allowing the disappointment of that play cost the Bulldogs the game, Canton’s defense went right back out and made the plays it needed to give the offense a chance to win it. The Bulldogs move to 3-0 and head into a showdown with fellow unbeaten Foxboro next week at World War II Veterans Memorial Field. Bohane joked that maybe it would be the HockomockSports.com Game of the Week, but he also said that beating Milford will give his team confidence that it can play with the top teams in the Davenport.